Vietnam’s relationship with art is a long story that rivals the history of other countries. Though it doesn’t have any significant influence or contribution to the international scene, it does have a very rich history. From art going back to the Stone Age up to the modern age of art inspired by western styles. Vietnam, though a poor country, is rich in culture and with it, art. Art in Vietnam started similarly when compared to other old civilizations. Archaeological sites in Vietnam revealed old sculptures, old paintings, ceramics and paper. The oldest one, a primitive clay pot, is believed to be from around 8k BCE, during the famous Stone Age, and was discovered in Bac Son, Vietnam. Just like other civilizations, the ancient people of Vietnam eventually learned to decorate these clay pots. Their decorating techniques from the Stone Age eventually led to the massive improvement in art during the Bronze Age. Vietnamese Bronze Age is divided based on the development stage: the Phung Nguyen, the Dong Dau and Go Mun. Eventually the techniques develop during those stages were passed on and improved by the Dong Son civilization. The Dong Son civilization ruled Vietnam from 1000 BCE to the 4th century. Then around 111 BCE during the time of China’s rule, the Vietnamese traditions were mixed with some of those from the Chinese, especially in ceramic-making. Chinese tombs were excavated in Vietnam and revealed ceramics featuring influences from both Vietnamese and Chinese traditions, indicating that China’s rule did not leave without making an impression on the Vietnamese tradition. To be fair, Vietnam isn’t the only country whose culture had been influenced by the Chinese: The Filipinos and the Japanese, for example, were also heavily influenced by Chinese culture. China, being a huge and great country since ancient times, have been successful in influencing their neighboring countries. The everlasting effect of Chinese culture and philosophies remained even after the Chinese left Vietnam. During the Ly Dynasty, Vietnamese ceramics underwent another evolution, now coated with green glaze to produce greenish ceramics. Vietnamese architecture also started to take shape during the time, such as the influence in the One-pillar pagoda, Quynh Lam pagoda, and the Temple of Literature. But all of these advancements came undone when the Chinese returned. With more ferocity, it almost erased art in Vietnam for years and tried to replace it with the Ming Dynasty’s culture. It took all of the Le Dynasty for art to recuperate. After being dead for centuries Vietnamese art made a comeback after the Tay Son brother’s revolted and lost after they tried to take on the Nguyen Dynasty. Vietnam changed as it stepped into the 19th-century. For art, this means a revival, a permanent death and a replacement. Ceramic art and Western forms of art met in Vietnam. Some forms of art have permanently died, while some, like ceramic making, experienced a revival. Modern art forms, like portraiture, western music and theater, made their impact on Vietnam around this time. When socialism rose into power in Vietnam, it once again shut their country’s art down. All forms of media were controlled, just like how it was in any socialist regimes. It did, however, encourage art from other socialist countries. Socialist realism took another form where simplistic rules by the Part leaders dictated what was considered acceptable art. It didn’t last long, however, as the country saw the need to compete in the global market. Thus Vietnam had to throw its doors even wider, just like China did, and let more information and freedom from the outside in. Of course, there’s still censorship. But only enough to stop those critical of the ruling Party. 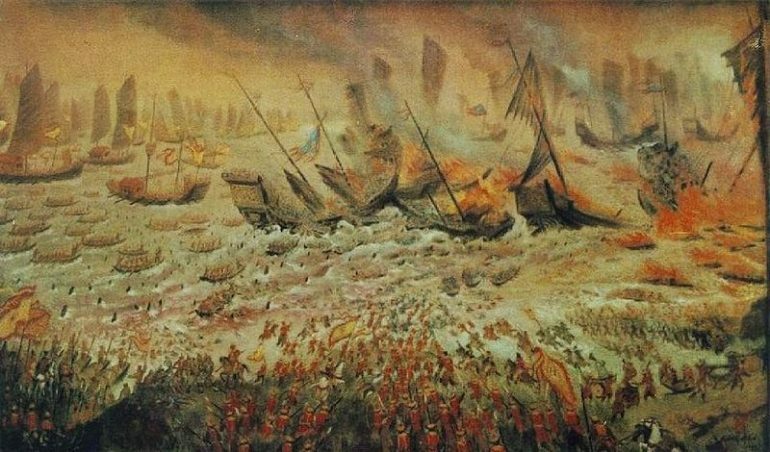 1st Image: Battle of Bach Dang, via Wikipedia. 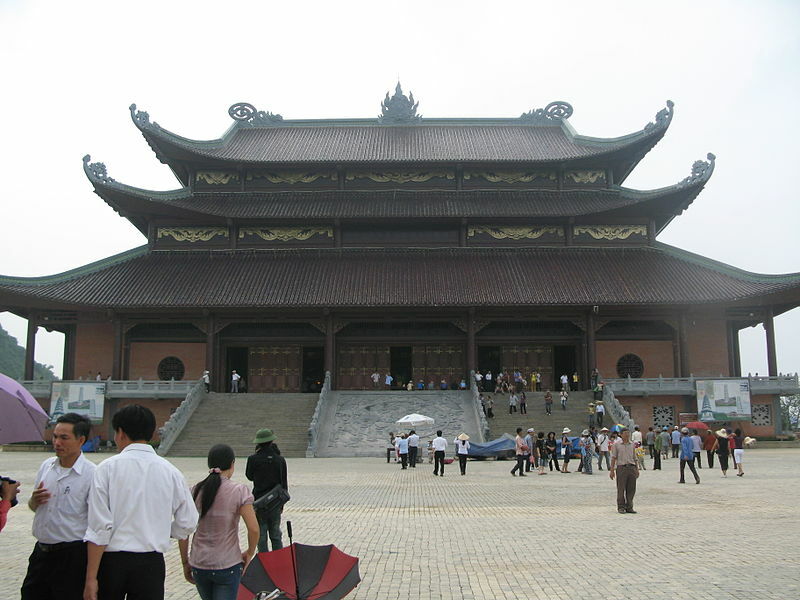 2nd Image: The Bái Đính Temple, an example of Vietnam architecture, via Wikipedia.